The wide range of machinery that MPPS mechanical and electrical engineers service and repair often involves work in confined spaces at the customers site, e.g. on power packs, lubrication systems, pumps and other machinery located in pits or service trenches located beneath the machine foundations. MPPS has qualified and accredited Service Engineers equipped with the appropriate access and emergency rescue equipment for working safely in confined spaces and comply with HSE Confined Space Regulations 1997 and other workplace regulations. 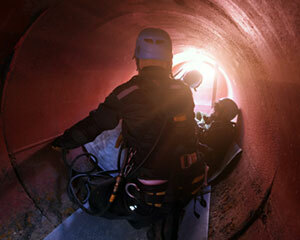 Our Engineers are trained, approved and certificated to Level 2 Medium Risk – confined space entrant and top man/woman. The engineers training included team working, use of access equipment, environmental monitoring and escape breathing apparatus. Accreditation is to City & Guilds 6150 qualification. All work by MPPS in designated confined spaces will be undertaken by a team of three fully trained and experienced engineers. MPPS provide, per entry, Risk Assessments, Method Statements and Emergency Rescue Plan before commencing work. MPPS has its own specialised equipment for Confined Space working, including a Counterbalanced Davit Rescue System fitted with recovery winch and fall arrestor – conforming to LOLER 1998 (Lifting Operations and Lifting Equipment Regulations). The Davit Rescue System we use is more suitable for the variety of operations we are likely encounter and can be safely used at a pit edge where a tripod system cannot. MPPS also have portable 4 way Gas Detectors (in accordance with BS EN 50073 advice). Having trained and accredited personnel with our own specialist equipment enables MPPS to provide a safe, fast response to service customer’s equipment located in confined spaces.